Now Taking Sea Bass Reservations to November 30th Except Thanksgiving Day - Regular Schedule With An Occasional Longer Trip Announced. Fishing everyday the weather's fit! Not Looking For "All-Limits, All The Time" Sea Bass Fishing. We are seeing some 15 fish sea bass limits - working for them. We've even had an occasional boat limit.. If sea bass management were holding a proper course, any client able to drop & reel would be able to catch 15 sea bass with one shiny bare hook. I believe sea bass management is having a very poor result in our region. I'll announce December trips as weather forecasts firm--like I announce tog trips. Saturdays 6:30 to 3:30 - $125.00 – Sundays At Weekday Rates: 7 to 3 at $110.00. - Other Longer Trips Announced When Winds Look Good. In Congress: Ask your Representative to support HR 3094, The Gulf States Red Snapper Management Authority Act, which gives allows the States bordering the Gulf of Mexico control over their red snapper--a species supremely responsive to increased habitat via oil wells & artificial reef. At issue's core are recreational catch estimates.. Despite incredibly detailed analysis showing red snapper populations at all time historical highs; and, also owing to habitat increases, even large snapper populations in areas where they had never been caught before, Federal regulators (NOAA/NMFS) use catch estimates to hold the season under two weeks. It is also true federal red snapper population estimates are done by trawl survey. It's never been easier to write your Congressional Representative. Every time a Congressional member hears about bad catch estimate data's effect on fisheries it helps push management toward a better outcome. First New Truckloads Of Concrete Pipe Saturday 11/14 - Our largest pre-cast concrete project ever was this past March & April. The Reef Foundation Has Secured The Services Of The 105 x 30 Foot "Iron Lady" Again For Several More Months. This week we hope to deploy two loads at Russell's Reef. One at Nanna & Barry Daub's, the other at Big Joe & Tony's Barges..
Got two days of fishing in since my last report. Pretty tough weather this November..
On one of the trips we had about a third of clients limited, on the other we were in an hour early with a boat limit. Nice when it happens. Weather suddenly looks great for Tuesday & Wednesday's sea bass trips. Both days have a very light rail but I switched them to the 6:30 format anyway. We almost always leave around 6 for a scheduled 6:30 trip. Thanksgiving & Christmas are the only two days I won't fish. Calm said to remain, we're back at it for Black (sea bass) Friday. Saturday isn't looking too swell right now; err, the swell's looking too big? My crew & I have been hustling reef material when not fishing. Last week we cleaned up a boatload of steel reef debris from the trawler "New Hope" prior to its deployment at Capt. Bob's Reef. 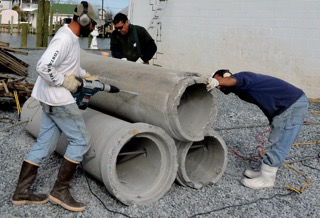 Since then we've already had 7 truckloads of concrete pipe & such come in. When possible I like to fashion pipe units because they'll resist scour. The ocean's incredibly powerful. If you'll simply imagine your feet sinking into the sand as a wave recedes, you can believe height is what makes a concrete reef last centuries. It's a lot more work though..
A smaller 3 pipe unit takes shape. 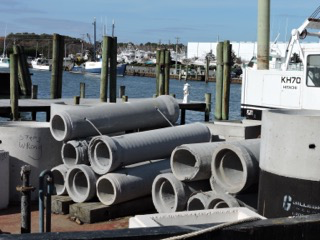 Were these pipe reef units used for oyster restoration instead of coral, a small bag of pre-spat material could easily be attached where the cable passes through just prior to deployment. Each unit would offer a de-facto brood-stock preserve..
Two 6 pipe units stored aboard the Iron Lady & destined for deployment at Nanna & Barry Daub's Reef..
..if NOAA will let them! Headed that way, toward ecosystem-based management; the biggest roadblock is in present day management's required use of MRIP. Take, for instance, MRIP's 2014 Private Boat tautog NY & CT. They total well over 2 million pounds of tautog in just 4 months - from two estimates. The entire For-Hire Party/Charter industry, however, is thought to have caught approximately a million pounds over 5 years - dozens & dozens & dozens of estimates. So, according to the "best available data" that our state & federal managers MUST USE - NY & CT Private Boats caught as many tautog in two months as all US Party/Charter will catch in a decade. A hallmark of artificial intelligence is a system that learns from its mistakes. Yeah, um, MRIP's not going to qualify. This EXACT situation is foundational in the Gulf of Mexico's red snapper woes. Management is doing backflips to try to preserve businesses with 'sector separation.' Here quota is split-up between Party/Charter & Private Boat. Because MuRFSS & later MRIP have so inflated Private Boat catch since 2003, virtually ALL of the "overfishing" of red snapper stems from MRIP Private Boat catch-estimates. Because NOAA demands everyone in management use MRIP data - and because EVERYONE can plainly see the data's full of manure - there's a full-on feud between State & Federal fisheries management in the Gulf. Meanwhile, because management has to leap into action every single time MRIP has another psychotic moment, something as simple as building artificial reef gets no attention whatever. Seafloor habitat loss over many decades would be obvious to anyone who would go look. Ecology & population biology merit no thought whatever while every new set of MRIP catch-estimates creates an 'overfishing' fire somewhere that needs to be put out. National standard one mandates regulators use the "best scientific information available." Apparently that applies even when the information is plainly wrong. NOAA needs to stand down. Today catch-estimates form management's backbone. Were stock assessments (fish population estimates) used instead as management's primary guide, the endless annual battles over season, size limit, & bag limit for many species would simmer down. Perhaps in management's new free time they might then notice sea bass like coral & tautog really respond to robust habitat with lots of nooks and crannies..
Marine fisheries restoration is a youthful endeavor. I honestly believe once we have MRIP either accurized or simply relegated to a nice padded room somewhere near Silver Spring, reef fish restoration methods can be fashioned that will take populations far higher than any now dream.